Any idea what STEM is? The Taylor School District continues to improve in leaps and bounds, in part thanks to new initiatives that are being created and implemented while you are reading this post. Yesterday, we posted a story about the first day of "college" for current Truman and Kennedy high school students taking part in the all-new TSD-Wayne County Community College District partnership. 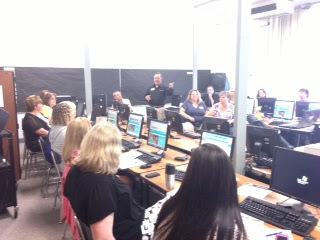 Today, we take note of training that started this week focusing on STEM. It started at the Sixth Grade Academy. It should be noted that Taylor is the first school district in Michigan to bring in this particular STEM plan to its students. This in part will set the stage for the possibility of a full STEM academy in the district in the future. 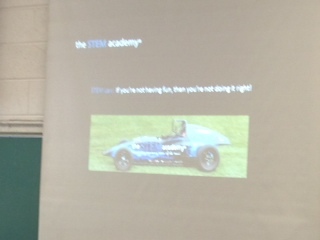 The STEM Academy is a national non-profit organization dedicated to improving STEM literacy for all students. It is a next-generation high impact academic model. Practices, strategies and programming are built on a foundation of national best practices, designed to improve under-represented minority and low-income student growth, close achievement gaps, decrease drop out rates, and increase graduation rates. The program also focuses on improving teacher and principal effectiveness. It's a flexible program that targets all schools and can be used for all students. According to the educational experts. STEM stands for Science, Technology, Engineering and Mathematics -- but it really stands for much more. It is a program that seeks to aid 100 percent of the students and staff, and is interconnected (for instance, because design is taught in art does not make it a STEM lesson). The mission of the program ultimately will be to prepare K-12 students to be competent and capable in a technology-driven world through comprehensive student assessments including traditional tests, project-based learning presentations and portfolios. According to Asst. Supt. Teresa Winnie, Taylor is incorporating the program into its current core curriculum, utilizing the projects that enhance our curriculum and give students the first piece of the STEM overall plan. To learn more about STEM, click here. 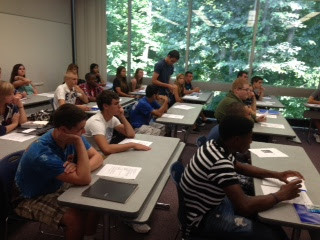 Early College Students taking part in the Taylor School District-Wayne County Community College District Partnership began school today on the Downriver Campus. "We had plenty of TSD support there today -- Tommie Saylor, principal at Kennedy, Melissa Skopczynki, principal at Truman, and Lori Rush, a Kennedy counselor," said Assistant Principal Teresa Winnie. "We are so proud of our students who are taking advantage of this program." The program, announced by Supt. Diane Allen in the spring, gives Taylor School District students a chance to earn a year of college credit while they still attend the district's high schools. 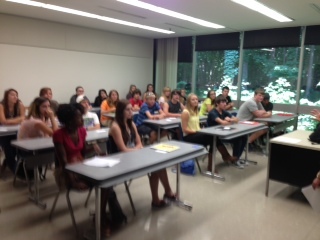 Beginning today, 11th graders started attending a schedule of eight specific courses offered by the WCCCD. 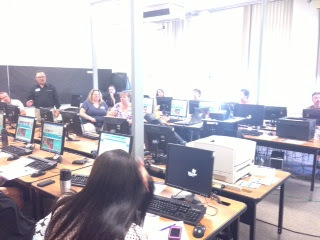 These courses are paid for by the district, and the only cost to the families involved are textbooks. Thanks to this unique arrangement, each student and his or her family is saving $368 per designated class or a total of nearly $3,000 in total over the two-year period of the program. The students take two college courses each semester. After taking their morning classes and eating lunch at their respective high school, they are bussed to WCCCD for their two classes. The courses all apply to the student's high school transcript and are counted for graduation. They also apply directly toward 70 colleges and universities in Michigan, including transfer agreements with the University of Michigan (Dearborn and Flint included), MSU, CMU, EMU, WMU, Grand Valley and Oakland. The eight courses include speech, two English courses, Psychology, American Government, Sociology, Visual Arts and Biology. 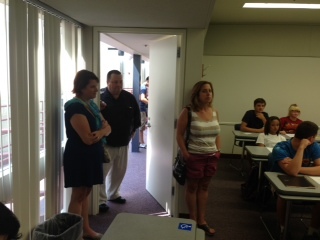 Upon successful completion, each student will have earned 25 credits and can enter college with a sophomore standing. Look for more on this partnership program in future blog posts. There's a cute homemade YouTube video focusing on "Back to School Study and Organizational Tips," made for middle school and high school age children. It's not long, just under four minutes, but offers plenty of methods to improve your studies in the fall. Parents, you can adapt many of this tips for children in elementary school. Most of the best study tips are just basic common sense -- finding a special quiet place, using the right binders and folders, highlight pens and sticky notes. This young lady, however, makes studying even more interesting by incorporating music and acronyms into your study skills. Enjoy your August, but get ready for fall. This last weekend I traveled to the Kalamazoo area and attended my 30th class reunion, Gobles High School class of 1983. This was the first class reunion I have ever attended, and as a result, I was able to visit with some of my old classmates. For most people, this would be a time of joy, an experience worth looking forward to having, yet I was very apprehensive. I was apprehensive because high school was not exactly all that fun for me. It was not torturous, but at the same time, it was not enjoyable. You see, I was the principal’s kid in high school. As the principal’s kid, I was treated differently than all the other students. Even though I was a starting lineman on the football team for all four years of high school, I never really fit into the “jocks” group. I guess they were concerned that I would tell my dad about all the mischievous actions in which they engaged. Even though I was a member of both the marching and symphonic band, I never really fit into the “band” group. Likewise, though I graduated near the top of my class, I did not fit in with the “brains” group, and I was not one of the “cool” kids. I certainly was not a “teacher’s pet” with my father being their boss. In short, I was basically an outcast, one of those students who hung around the edges of high school society looking in. But what did I discover back then? A group of other students that were just like me. Soon I became the unofficial leader of a group of misfit students that reminded me of the children’s Christmas cartoon Rudolph the Red-Nosed Reindeer and the island of misfit toys. I happened to fall into a group of misfit students, or perhaps we were more like the movie Revenge of the Nerds, and I was the character Lewis, king of the Nerds. Either way, I found a group that accepted me as me, and did not care that I was the principal’s kid. From this group I learned some very valuable lifelong lessons. I learned that everyone has value. I learned that every living soul has something to contribute to the human race. I learned that every person, by nothing more than being alive, deserves basic human respect and to be treated with dignity. I learned that by trying to diminish the value of any one of us, we diminish the value of us all. I learned that everyone has the right to be heard, that we all deserve the right to simply be who we are – that we are all equals, and that no person “stands” above the next. Simply, when I left high school, I walked away with more than just a basic working knowledge of Math, Science, English and Social Studies; I walked away with a greater understanding of what it means to be human. Why did I tell you this story? Well, as we are gearing up for another school year, I want to remind everyone the importance of getting to know your students, the importance of forming good positive relationships with your students. Without even realizing it, you may very well become the most important person in the life of one of your students. That student that always sits in the back of the class, that never really talks to anyone, that seems uncomfortable around others and a little standoffish, is silently screaming for attention and waiting for someone to show him that they care. Teachers need to be that someone. As for my reunion: My old friends and I sat back in the corner of the room and had a nice visit. But we could not help noticing that almost all of the popular kids in school never really went very far in life. Around the table that I sat were CPAs, CEOs, CFOs, corporate vice-presidents … and a school administrator.